Summary: There is a dimensional whole looking object circling around the earth that nobody could figure out what it is. 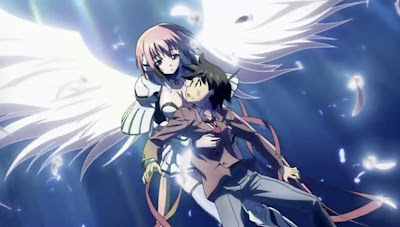 Tomoki has been dreaming about a girl all this time, and on night, a girl with angel wings fell out of the sky in front of him which could grant his any wish. First impression score: 80 ~ WTF? Personal comments: There are quite some extreme mood swings within the episode one. Aside from that, everything else screams WTF.